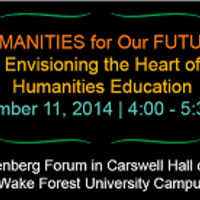 Join local educators and cultural leaders for a panel discussion and open dialogue about the future of humanities education (from 4-5:30 p.m.), inspired by The Heart of the Matter, the 2013 report of the American Academy of Arts & Sciences Commission on the Humanities & Social Sciences. Panelists will include: Superintendent of Winston-Salem/Forsyth County Public Schools, Beverly Emory; WFU Presidential Endowed Professor of Southern History, Michele Gillesipie; WFU Provost and Professor of Political Science, Rogan Kersh (moderator); WSSU Dean of the College of Arts and Sciences and John W. and Anna Hodgin Hanes Professor of the Humanities, Corey Walker; and North Carolina Humanities Council Executive Director, Paula Watkins. The event, free and open to the public, will be followed by dinner (beginning at 5:45-7 p.m.) and table discussions for those who reserve ahead (limited seating for dinner). Sponsored by the Wake Forest University Humanities Institute and the North Carolina Humanities Council, with support from the National Endowment for the Humanities. Please direct questions to the WFU Humanities Institute at mephamam@wfu.edu. Kudos to the panel for bringing unscripted, deeply thoughtful and provocative ideas to the opportunities and needs present in society which faculty, administrators and students in the humaniites need to address directly. I liked continuing the discussion at dinner with community partners and classroom educators. . .K-12 public schools need "us"; that is where the attention can be and how better to determine a future in which the humanities are naturally and fully embedded?